The battle will between Team YJ7 (Weekly Young Jump) and Team YM7 (Young Magazine) heats up as the two teams continue to compete in a variety of rounds. Round 4's theme has been decided as Special Skills Movie Battle, aka the girls will show off their special skills in a video. The starting date has yet to be decided, but stay tuned. 3 days ago, Round 3 - Radio Battle in All Night Nippon concluded and the results were revealed on the same night. The only round YJ7 has won was Round 2 - Karaoke Movie Battle. YJ7 will need to buck up and win the next round if they want to stay in the competition. YM7 has 21k votes more. 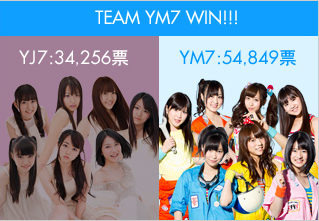 I've said that YM7 would win because of the popularity imbalance between the members of each team. In fact, from the profile page on the battle website you can see who they were marketing as the "main" of the team. With the 3rd Senbatsu Elections, Rie, at #13, is now supposedly the most popular member of YJ7 instead of Miichan. Meanwhile, Sasshii, the "main" of YM7 is at #9. I'm still waiting to be proved wrong, but can it happen? As a sidenote, it's ironic how Rie was the center of Team YJ last time and then she ranked below both Chiyuu and Miichan (who were also in YJ) in the 2nd senbatsu elections. This time Miichan was expected to bring it for YJ7 and Rie outranked her. No offence as a Rie oshi, I love them both. What i'm thinking is more of... some kind of curse with being YJ's main?